Germany 1949, four years after the end of WWII and the country is still in ruins. A 1944 bombing raid had destroyed the Braunschweig factory. Franke&Heidecke, who introduced their successful Rolleiflex in 1928, start a series of improvements on the well appreciated camera. 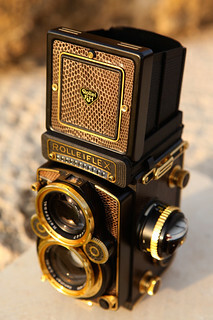 The Rolleiflex 2.8A sees the light of day. 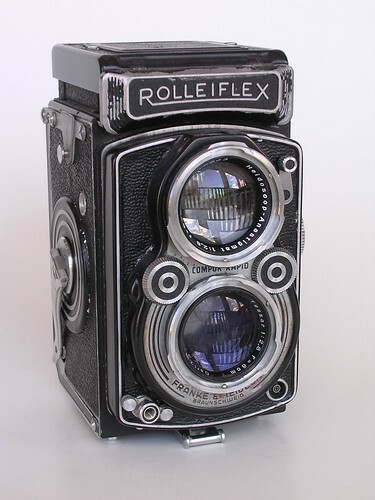 In 2002 Rollei Fototechnic GmbH introduced the last version Rolleiflex 2,8 FX, later, till 2014, produced by DHW Fototechnik. 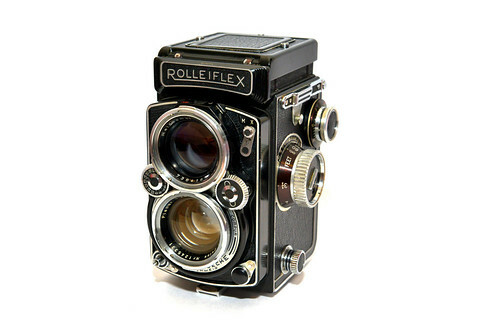 All Rolleiflex 2.8 cameras have a Compur shutter with at least B, X-sync and speeds from 1-1/500s. Only exception is the first version of the 2.8A. All models have a winding lever that stops at the first exposure. All accept at least 120 film, models from the 2.8F (#2.455.000) onwards also take 220 film. 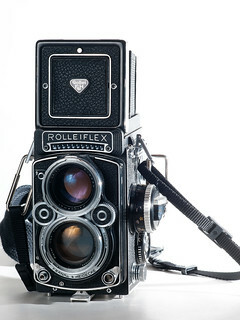 The Rolleiflex 2.8A model K7A of 1950 is the first one with the larger aperture Zeiss Opton Tessar taking lens and a Heidoscop viewing lens. The first version uses a Compur Rapid X shutter with speeds of 1 - 1/400 sec., B, X-sync. But does not have M-sync. 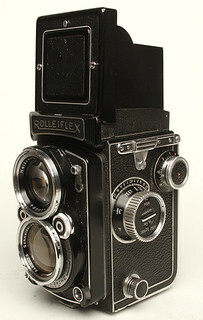 The second version released a year later in 1951 uses Compur Rapid MX shutter with speeds of 1 - 1/500 sec., B, M-X-sync. Bay II filter are used. Production : from 1949 to 1951, about 9.870 units. Almost entirely sold to the USA. Carl Zeiss Jena Tessar 1:2.8 f=80mm, coated. or : Zeiss Oberkochen Opton Tessar 1:2.8 f=80mm, coated. Filter Bayonet : Both lenses, size 2. Shutter: Compur-Rapid X CR0 leafshutter. Speeds 1 to 1/400 sec. (later to 1/500 sec.) and B. Flash synchronization : Sync socket on frontpanel. X synchronization, later also M-synchronization. The 2.8B model K7B was released in 1952 and uses a Zeiss Biometar 2,8/80mm coated lens with the finder using the Heidoscop 2,8/80mm, both use a Bayonet III filter. Only differences with Rolleiflex 2.8A shown. Production : from 1952 to 1953, about 1.250 units. Almost entirely sold to the USA. Taking lens: Carl Zeiss Jena Biometar 1:2.8 f=80mm, coated. Filter Bayonet : Both lenses, size 3. Shutter: Synchro-Compur MX CR0 leafshutter. Speeds 1 to 1/500 sec. and B. Flash synchronization : Sync socket on frontpanel. M and X synchronization. The 2.8C model K7C was released at the end of 1952. Early cameras were only available with a Schneider Xenotar 2,8/80mm taking lens, while later cameras (release from 1954 onwards) also could be had with a Zeiss Planar 2,8/80mm. Another major change with earlier versions is the ability to switch off the double exposure prevention. 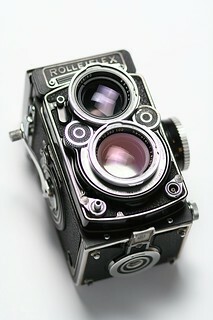 Only differences with Rolleiflex 2.8B shown. Production : from 1952 to 1955, about 30.150 units. Schneider-Kreuznach Xenotar 1:2.8 f=80mm, Coated. or Carl Zeiss Oberkochen Planar 1:2.8 f=80mm, Coated. Shutter: Synchro-Compur MXV CR0 leafshutter. Speeds 1 to 1/500 sec. and B. The 2.8D model K7D of 1955 is similar to the previous model, using the same Schneider Xenotar 2,8/80mm and Zeiss Planar 2,8/80mm taking lens. The aperture and shutter exposure settings on this model now support the EV system. The EV numbers (3 to 18 EV) are on top of the shutter speed dial knob. It has an arrow indicator that can be coupled to the aperture dial. It can be uncoupled by pressing the button on top of the aperture dial. The shutter released lock guard has changed in design and is much larger. 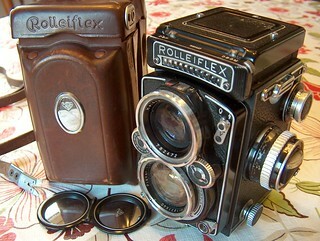 Only differences with Rolleiflex 2.8C shown. Production : from 1955 to 1956, about 20.100 units. With EV coupling and linear speeds and diaphragm. The 2.8E model K7E of 1956 is similar to the previous model, but the main difference it the addition of a exposure meter. The meter is based on a selenium cell. The meter is not coupled to the shutter and aperture settings. Meter settings can be adjusted on the focusing knob. The 2.8E could be bought with or without this exposure meter. A version called 2,8E2 (K7E2) became available in 1959. This version has optional metering. A version called 2,8E3 (K7E3) was made a couple of years after the K7E2. Only differences with Rolleiflex 2.8D shown. Production : from 1956 to 1959, about 44.000 units. The 2.8F model K7F of 1960 was available for the longest. Available for 20 years with four minor revisions up to the K7F4 of at the end of 1981. The F versions removes the EVS system. The first revision K7F uses Planar lens and uses 120 film and has the 12 frame counter. K7F2 was released in 1965, like most 120 film camera revisions released that year it was because of 220 film and provided a new 12/24 frame counter. K7F3 is nearly the same but simplifies the back and no longer takes the flat glass adapter. The K7F4 typically has the Xenotar lens. Later limited production camera runs became available such as the Aurum(1983, c.1500 units) and K7FP Platinum edition (1984 till 1985, c.500 units) and the K4FPA till about 1989. In about 1988 the 2,8GX series was released. Only differences with Rolleiflex 2.8E shown. Production : from 1960 to 1981, about 82.200 units. Coupled Depth of Field indicator. From halfway 1964 : Meter- and Feet-scales alongside each other. This page was last edited on 27 November 2016, at 07:16.